A few years ago I got into a fairly heated Twitter argument with my old flatmate about Todd Hayne’s unconventional Bob Dylan biopic I’m Not There. I wanted so much to love it but, aside from Cate Blanchett, found very little to get too excited about. It was an interesting concept but I couldn’t help feeling it was all style and no substance. He, as someone who is a hell of a lot more Indie than I am, was outraged at my criticisms. I always intended to go back and rewatch it but my first viewing has filled me with an unending wariness of films loosely based on the lives of famous folk singers. So it filled me with dread and some sadness to discover that for their latest film the Coen brothers took inspiration from the memoir of the late Dave Van Ronk, The Mayor of MacDougal Street, to tell the tale of Llewyn Davis. Whilst not an out and out biography there was some concern about how it would end up. Plus the Welsh link isn’t exactly subtle and it is hard not to add your own level of subtext. However, the trailer is just magnificent and the Coens so rarely steer me wrong. If anyone could rectify Hayne’s mistakes it would be Joel and Ethan, right? Inside Llewyn Davis takes the audience right into the heart of New York’s folk scene in the early 1960s to follow a turbulent week in the life of success-hungry musician Llewyn Davis (Oscar Isaac). Llewyn is haunted by the past and constantly struggling to get past the obstacles that so often grace his path to making it. Our protagonist is in mourning for his former singing partner, Mike, who committed suicide and left the hapless Llewyn to flounder in the world of solo artists. His debut LP, whose title is stolen by the film, is not finding the success that he was hoping for: leaving him with no other options but to couch-surf and compete against lesser (or so Llewyn believes) acts for gigs in dark, dank venues around the Village. that he may have impregnated her, asks the friend he cuckolded (Justin Timberlake) for money to pay for an abortion. In his head, Llewyn is a suffering artist who isn’t being given the break that he deserves and he is ready to take his frustration out on those closest to him. But, as we have seen so many times before, great genius is often associated with poor social skills. Although, is Llewyn actually the undiscovered musical savant he believes himself to be? The Coens never definitively answer that question. After a fraught journey to Chicago, Llewyn performs an audition for Bud Grossman (F. Murray Abraham), owner of the Gate of Horn, only to be told that there’s probably no money in it. Llewyn, according to Grossman, just doesn’t quite fit as a front man. Just as he needs additional harmony for his singing, Llewyn finds himself being unable to cope by himself. (An idea that many people will probably want to relate to the brothers’ fears regarding their professional reliance upon each other.) Throughout the narrative Llewyn is constantly acting as his own worst enemy and making decision that will clearly come back to haunt him. It’s not exactly the making of a leading man but, let’s face it, in the world of the Coen brothers there are no real front men: just sidekicks or hopeless wannabes who struggle to make their way in the world. A fact that could very easily destroy the film but, thankfully, the combined talent of the Coens and Isaac ensures that Llewyn remains engaging. Despite all of the mistakes and terrible behaviour the character somehow remains personable enough to ensure you’re still with him every step of the way. You aren’t sure that you want him to succeed but you can’t help but follow his journey. Of course, this may also have something to do with the fact that you are, literally, with him every step of the way. From the very minute Llewyn finds himself out on the wintery New York streets trudging through the snow you are right beside him. You are also experiencing that harsh 1960s winter that has been so beautifully realised by Bruno Delbonnel with his desaturated colours. Inside Llewyn Davis is one of the most perfectly crafted films I’ve seen in a long time. The script is incredibly smart and perfectly balanced: between the profound melancholy that clouds the narrative there are wonderful moments of utter hilarity and warmth. With no real plot to speak of it would be easy to dismiss this as pointless but the scenes that unfold before your eyes are utterly engrossing that you won’t miss the lack of direction. 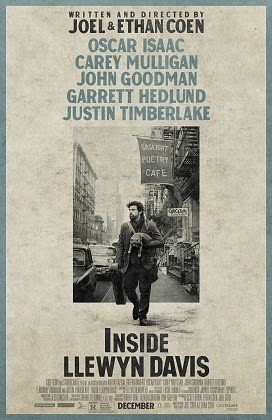 Alongside some superb supporting turns from John Goodman, as the straight-talking and world-weary Jazz musician that joins Llewyn on his trip to Chicago, and Carey Mulligan, playing the gloriously angry young woman Llewyn may have planted his seed inside, there is little chance that the ambling nature of the plot will even show through. Of course the one thing that holds this film together more than anything is the same thing that is at the core of Llewyn’s entire existence. The music that litters the narrative is performed adeptly by the entire cast and adds greater depth to the emotional struggle on screen. It is the kind of soundtrack that demanded to be purchased as soon as the credits began to roll and I haven’t stopped listening to it yet. T-Bone Burnett, the Coens’ long-time collaborator, has expertly matched the overall tone of the film. The chosen songs are played out in full, a potentially risky decision which actually pays off gloriously. Like all good folk songs, the soundtrack is beautiful, emotive and soul-cleansing. It would have been easy for the brothers to dismiss Llewyn as another deluded and talentless performer scrabbling for notoriety but instead they gave him a certain amount of credibility and a genuine chance. Isaac’s voice is the one pure and beautiful thing in Llewyn’s depressing world and it is the very thing that gives him a humane side. Using his struggles to his advantage Llewyn is able to perform some genuinely touching music even if nobody seems to appreciate it. The film offers a selection of music that is permeated with the sadness and frustration of one who is unable to realise his dream and who must know, deep down, that it will remain unrealised. This film is quite simply a pleasure to experience and is certainly one of the brothers’ finest.